Claire Jones interviews award-winning artist Sophie Ploeg. Opera music is playing quietly in the background when I visit award winning artist and Severn Art Trail exhibitor Sophie Ploeg at her home to talk about portrait painting and her passion for art and textiles. Her studio is in the heart of her family home, which means she is able to be around for her children, yet still put in a substantial number of hours every day to create the mesmerising portraits in oil for which she has become widely respected. Although she always loved to draw, Sophie spent many years studying art history at university, before switching to painting after her children were born. In the past decade she has taught herself the techniques needed to create her exquisite portraits, many of which feature fine fabrics and lace. 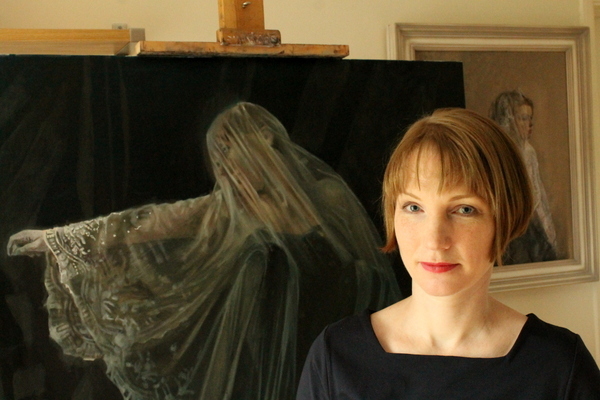 The high point of her career so far came in 2013 when she was chosen to exhibit in the BP Portrait Award Exhibition, and won the prestigious BP Travel Award, which enabled her to spend a year researching how lace is represented in early 17th century portraiture in the Netherlands and England. She spent 8 months exploring the history of lace and art in her native Holland as well as in Belgium and closer to home at Honiton in Devon, and subsequently produced a collection of ten paintings entitled The Lace Trail depicting modern women and girls wearing 17th century lace. These were exhibited at the National Portrait Gallery for the BP Portrait Exhibition 2014. 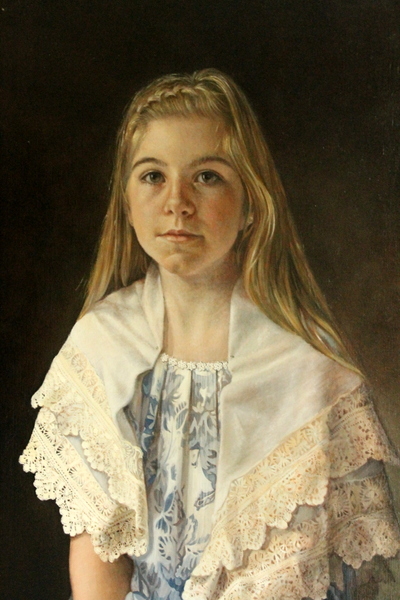 Her portrait of a 21st century girl wearing a kerchief edged with authentic Flemish bobbin lace from the mid-17th century over her own favourite top is an example of how Sophie brings together the ancient and modern. Back when the lace was made, a 9-year-old girl would already be an accomplished lace-maker, having started her training at the age of 5. Sophie’s love of textiles and lace comes from her childhood, and both a mother and grandmother who loved fabrics and made their own clothes. She has always lived in a house where there were piles of fabric, and she has continued this with her own growing collection of antique lace and other textiles and notions that she uses in her paintings. She has the greatest respect for the hours and hours of painstaking work that went into making the early lace from the 17th and 18th centuries. A piece that is 400 years old is now understandably very fragile, and often museums choose not to display their collections, partly to avoid deterioration. You can find out more about Sophie and see more of her paintings at sophieploeg.com.